The body would be stripped and placed on a board. The brain was extracted though the nose with a tool that had a hook on the end. The empty brain cavity would be later filled with a combination of linen and resin(A sticky flammable organic substance, insoluble in water, in some trees and other plants). The chest would then be cut open and the main organs would be removed with exception of the heart. (ewww) The organs, after being removed, would be stored in Canopic jars with a drying agent. (double eww)These jars were normally in a set of four, representing the four sons of Horus. These organs may also be wrapped in four packages and placed back in the body or be wrapped in one package and placed on the mummies legs. Slightly different mummification processes would be used depending on the time period in Egyptian history, so they say. The body cavity would be washed and packed with natron. (a natural occurring drying agent in Egypt). The body would dry for up to 40 days. After the body was dried, it was sewn back together and the cut was sealed with wax or metal. At times, the body may be filled with linens, saw dust, salt, or ash to keep the body firm. Their eye sockets would be filled with linen or fake eyeballs depending on the time. The body would be cleaned and wrapped in a very thick layer of linen. When this was completed, the body was ready to be transported to the tomb prepared for it. Before the body is laid to rest, a burial mast would be placed over the mummified body. 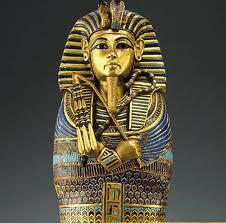 The most famous burial mask was found the in tomb of King Tut. His tomb was named the golden tomb of King Tut because his tomb had the most gold in it of any tomb they've found so far(below). Right, back to mummies. The body would then be placed into a sarcophagus, a type of coffin, to protect the body. The more wealthy and powerful they were, the more elaborately decorated these were. There also may have been several layers of caskets into which the body would be placed. hey also would make hundreds of clay figures to place in the tomb, to serve as servants in the after life. There, I got that over with! If you had to become sick in any part of the middle east at this period in time, Egypt was probably the best place to do it. Egyptian doctors were worldly renowned as being the 'best doctors around' and the probably had the best remedies at that time. Herbs played a huge role in Egyptian medicine. Proof comes from burial sites, tombs and underground temples where archeologists have found many sets of medical documents and scrolls. They had a whole lot of remedies that were believed to work, but a whole lot a wacky ones that, as we know now, definitely, do not work. When i was in Egypt, our guide told us that for a tooth ache, you would be given mouse dung, mixed with other disgusting thingsthat a sane human being now a-days would not consume.Yeesh! Egyptians consumed raw garlic and onions for endurance and to heal asthma and bronchial-pulmonary issues(lung problems). Many of their herbs were steeped in wine and used as oral medicine. These were natural herbs, untainted by pesticides, herbicides, insecticides, or fluoridated water. 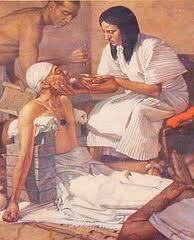 The Egyptians documented use of myrrh, frankincense, fennel, cassia, thyme, juniper, and even aloe. Fresh garlic cloves were peeled, mashed and macerated in a mixture of vinegar and water and used as a rinse for sore.Some of their practices were bizarre, as to be expected, and most likely did more harm than good. Several medical prescriptions contained animal poop, which might have useful molds and fermentation(the chemical breakdown of a substance by bacteria) substances, but were also infested with bad bacteria and must have caused many serious infections.Famous doctors,yes, Great healers, not so much. Although credit given where credit is due, they were advanced for their time.